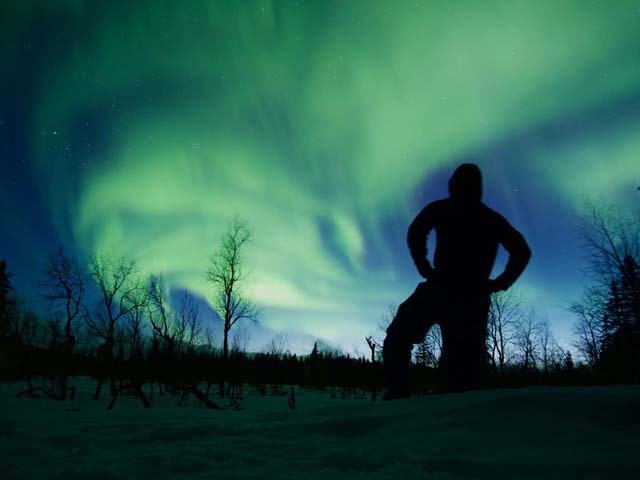 For many travellers, the adventure of driving your own dogsled and the opportunity to see a display of the Northern Lights are two things at the very top of their list. So why not combine the two and go dog sledding in the north of Sweden, Norway or Finland, where you will be far from light pollution and where the skies are often ablaze with the green, blue and red hues of the Aurora? 8 days (6 days’ sledding). Beautiful landscape of frozen lakes and forest near Kiruna in Swedish Lapland. Stay in wilderness cabins along the route. Tours offered from December to April, including Christmas and New Year. 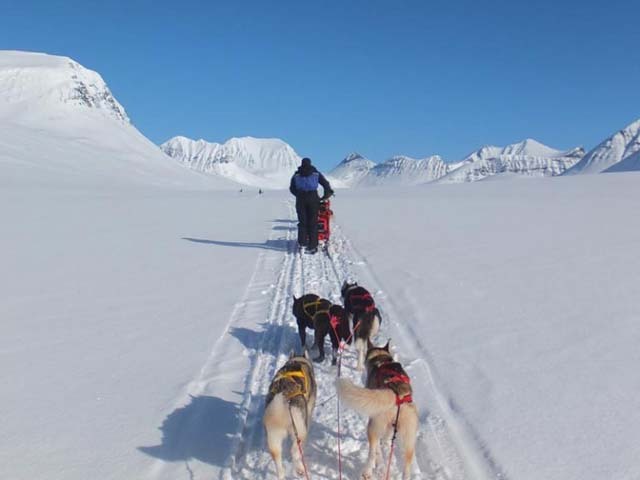 A good option for an extended dogsled adventure with a medium level of challenge, suitable for adults with general good level of fitness. 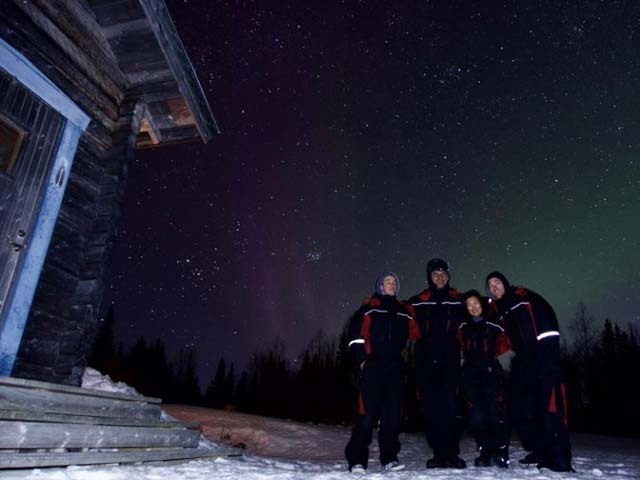 There is also a shorter version of this tour, Discover Dog Sledding in Lapland (4 days). Aurora display in Swedish Lapland. Photo: James Cartwright. 5 days (3 days’ sledding). A very remote area, sledding in the beautiful rolling mountain landscape of Vindelfjällen, Europe’s largest nature reserve. Tours offered November to April, including Christmas and New Year. An ideal option for a dogsled tour in mountain area yet possible throughout the winter season. Very small group size, just 4 persons. There is also a longer version of this tour, Wilderness Dogsled Adventure in Vindelfjällen (8 days). Silhouetted against the Aurora. Photo: Lydia Lam. 6 days (4-5 days’ sledding). Sledding in Pallas-Ylläs National Park, one of Finland’s largest protected areas. Based in comfortable wilderness cabin with sauna each night. Tours offered from December to March, including Christmas and New Year. A great way to combine a multi-day dogsled tour with the comfort and convenience of a fixed base. Under the Northern Lights. Photo: Lydia Lam. Dogsled on the famous King’s Trail in Swedish Lapland from Abisko to Kebnekaise. Sled between mountain cabins along the trail. Tours offered in the “spring winter” from February to April. Dramatic mountain landscape provides an amazing backdrop for a dogsled adventure. There is also a camping version of this tour, Dog Sledding and Winter Camping on the King’s Trail. Watching the Northern Lights from the cabin. Photo: Lydia Lam. 5 or 8 days (3 or 6 days’ sledding). Dog sledding in the tundra landscape of the Finnmark plateau. Stay in unique cabins at the kennels and wilderness cabins on tour. Cabin interiors and specialist winter clothing all hand-made from local materials. Offered December to early May. Multi-activity itinerary also available with other winter activities. 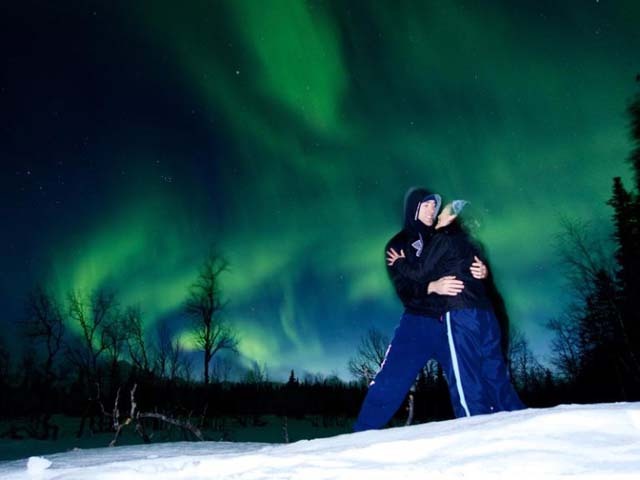 WHY IS A DOGSLED TOUR A GOOD WAY TO SEE THE NORTHERN LIGHTS? Assuming you choose a multi-day tour (which is the type of dogsled tours we specialise in, typical duration 4-8 days), you will be on your adventure for an extended period. 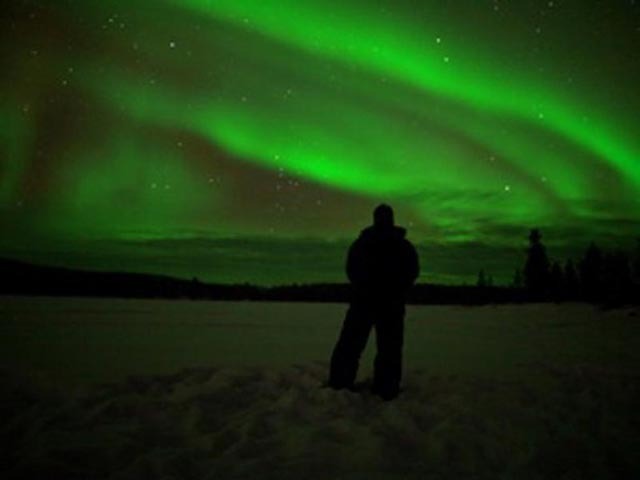 The more time you spend in the Northern Lights “zone”, the better your chances to see a display. 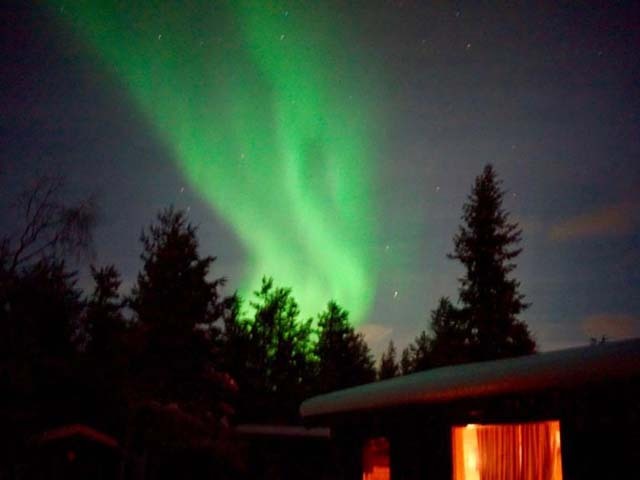 Typically your dogsled tour will involve staying in wilderness cabins (or in some cases winter camping) where there is no electricity and away from other settlements, so with very little light pollution. WHEN IS THE BEST TIME TO GO DOG SLEDDING TO SEE THE NORTHERN LIGHTS? 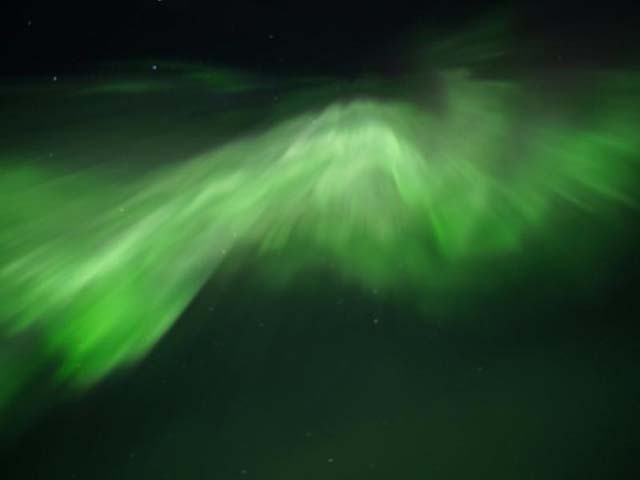 The Aurora may be seen, provided the skies are clear and there is activity of course, any time the skies are dark enough, which is from early September to early/mid-April. 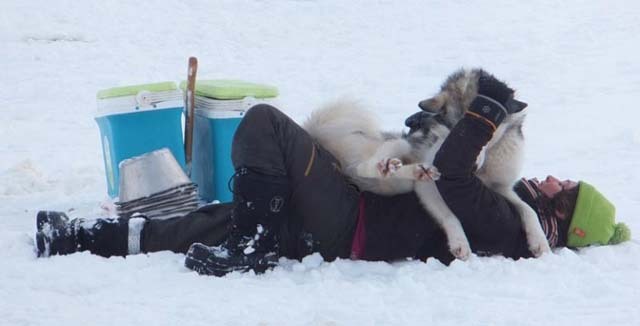 In the far north, the season for dog sledding runs from mid-November to early May, which means that, with the exception of the last part of season from early/mid-April onwards (which is also a spectacular time for husky sledding, by the way!) the Northern Lights can be seen all through the sledding season. On one hand, the shorter daylight hours (and so increased hours of darkness) of the deep midwinter period between November and January could be said to offer better chances, as there are more dark hours when displays could occur. On the other, the “spring winter” period from mid-February to April can offer more stable weather conditions, with increased chances of clear skies. You may need to stay up later, especially towards the end of the season, before the skies get dark enough to see the Aurora, but wonderful displays are frequently seen during this later part of the winter. Aurora activity can be very variable and is reliably predictable only a few hours ahead – it’s not possible to say far in advance whether any particular time will be better than another (though keen Aurora watchers may for example choose periods of new moon, when the skies are likely to be darker). In short, choose your trip dates to match when you think you’ll most enjoy the experience of dog sledding (and when you’re free of course). Don’t base them around the Northern Lights. With luck, you have good chances to see the Northern Lights on any of the tours listed above – perhaps even a number of times during your tour. 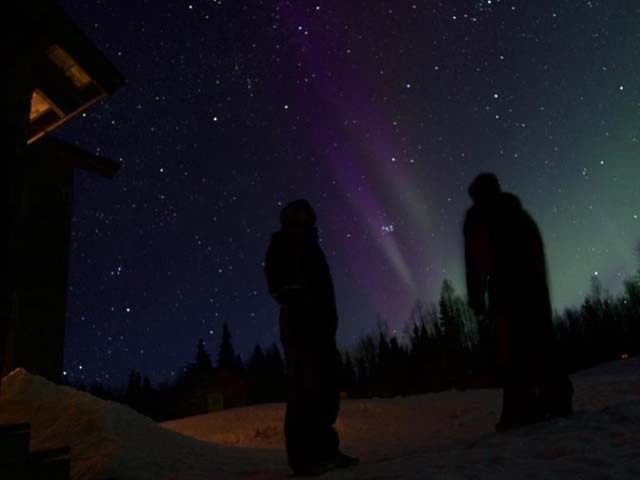 If Aurora displays occur, you will see them when at the cabins (or outside your tent if you’re particularly adventurous and are on a winter camping tour! ), in the evening after the day’s sledding is finished. When you are out sledding, it will be at least partly light, even if this is the beautiful, gentle “blue” dusky light of Midwinter, so the Northern Lights are very unlikely to be visible when you’re on the sleds. This is a very good thing, as you should in any case be concentrating on your huskies, managing the sled and looking where you’re going, not gazing at the sky! Dog Sledding and Winter Camping on the King’s Trail. Photo: Nature Travels. 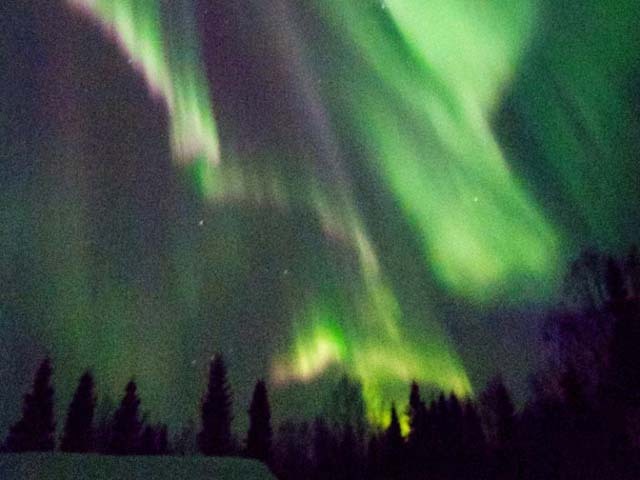 AM I GUARANTEED TO SEE THE NORTHERN LIGHTS ON MY DOGSLED TOUR? There must be Aurora activity at a time of day when the skies are dark. The skies must be clear where you are. You must be away from light pollution. You must be awake, and outside looking at the sky! The skies could be ablaze with Aurora wonders, but you won’t see them if you’re tucked up fast asleep in bed! Unlike a “Northern Lights Chase”-type tour using a vehicle (Nature Travels doesn’t offer this kind of tour), where you can potentially drive large distances if necessary to find an area of clear sky, there is no possibility to “search” for the Northern Lights when dog sledding, though you can of course certainly increase your chances by taking regular looks outside when at the cabins or in your tent, or staying up late on Aurora watch! You should bear in mind that, wherever you travel and whatever type of Aurora activity you choose, it’s possible that you won’t see the Northern Lights during your time in the far north. We therefore strongly recommend that you don’t base your holiday on a “make or break” opportunity to see the lights. A display is undoubtedly captivating and beautiful, but there is so much more to experience in a northern winter. Dog sledding is a wonderful adventure in itself, whether or not a display of the Northern Lights during your trip adds to the magic. In either case, you may well find that it was the experience of gliding through the winter landscape with your dogs that forms your most precious memories from your holiday! Happy Mushing and Happy Aurora Watching!